Variation Accepted: Operating between Plymouth Royal Parade and Travistock Bus Station given service number 12 effective from 25-May-2014. To amend Timetable. Other Details: Sunday to Saturday excluding Christmas Day, Boxing Day and New Years Day. Sunday service on other bank holidays. Other Details: Monday to Saturday. On Sunday the service will stop at Market Street. Sunday service will operate on bank holidays. However, there will be no service on Christmas Day, Boxing Day and New Years Day. Now the Tavistock to Okehampton service has been a bit of an open secret for some time but the next section was more of a surprise with a Sunday service through to Barnstaple which will use the same buses as used on the 11. Other Details: Sundays & Bank Holidays excluding Christmas Day, Boxing Day and New Years Day. 2 Journeys in each direction. 13 March: SERVICE DIVERSION: East & West Charleton closed to traffic - service 93 diverted via Totnes Cross: Tuesday 25 March. The road between West Charleton and East Charleton will be closed to traffic between 09:30 and 16:30. This is for road resurfacing. Therefore service 93 will be unable to travel on the A379 between Kingsbridge and Torcross in both directions. (It will still serve Stoke Fleming and Strete). From Torcross it will be diverted via the A3122 and A381 via Totnes Cross to/from Dartmouth. We are hoping the road will be opened to allow the school bus to travel the normal route. However this has not yet been confirmed by Southwest Highways. Therefore until this is confirmed please assume the school bus will also be diverted via Totnes Cross. We apologise for any inconvenience caused due to circumstances beyond our control. If you have any questions regarding this road closure please contact Southwest Highways on 01404 821500. 13 March: Good morning everyone, The 0740 2 from Royal parade will not be operating I'm afraid due to an operational issue. Sorry for any disruption this causes. 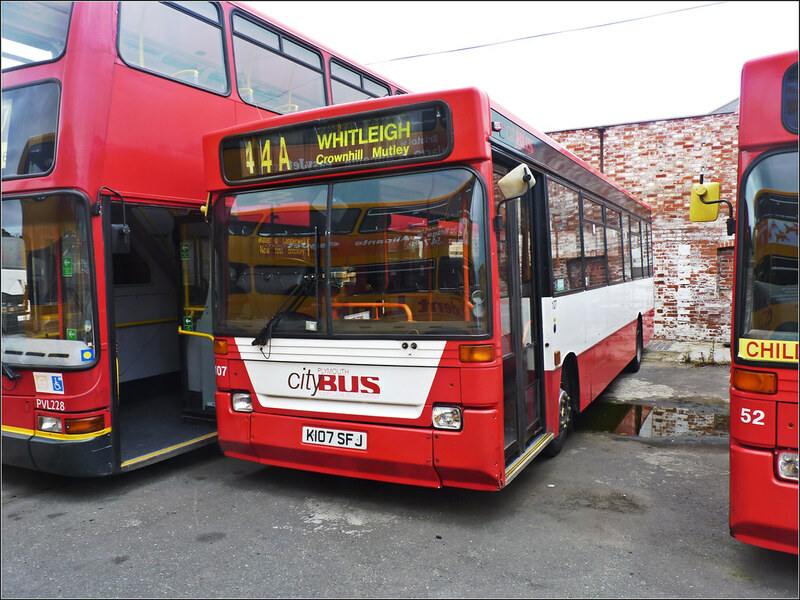 Jason Beverley: Hi all tonight sadly I can confirm that former Plymouth City Bus Dennis Dart Plaxton Pointer 107 K107SFJ which passed to country bus and was the last K in service by a long way has been scrapped. Storm-hit Dawlish: Where could a second rail line run? : At the same time as mending the track, Network Rail has been looking at three options for a possible secondary route into the South West. They all involve going back to old railway maps or reinstating former lines. Tweed Run Now it its sixth year, the Tweed Run is a mass cycle ride through central London in a more genteel manner than the lycra-clad speeders who usually ply the streets of our city. Super Silent Seven to Shenley  Let us limit recent omnibological traumas to the knowledge that the current holder of the Milton Keynes main operator (poisoned?) chalice is Arriva. FORTH BRIDGE NEWS NEW images of £15 million plans to develop the Forth Bridge into one of Scotland’s major tourist attractions have been released ahead of a public consultation into the plans. My only conclusion for the 75b registration is that Citybus have won the contract for the Sunday service to Barnstaple from Beacon Bus. I am surprised, though, that Devon County Council have not made them use the service number 118. The weekday service, though, may be an extra as it does not mention going through Brentor and Lydford - perhaps Citybus thinks there is a commercial need for Okehampton to have a through bus to Plymouth. Has David Sheppard of BBC Radio Devon fame lost his Trypist to VOSA in Leeds? Many years ago we had a link to from Okehampton to Plymouth with Okeridge of Okehampton then i believe it went to Gordons of Okehampton till he lost his licence.